Novotel Suites Riyadh Olaya is your home away from home when doing business, shopping or sightseeing in Riyadh. This 4-star boutique hotel takes pride of place among local landmarks in the growing business district. Its bright, spacious suites come with a host of modern amenities to make your stay at Novotel Suites as comfortable as possible. 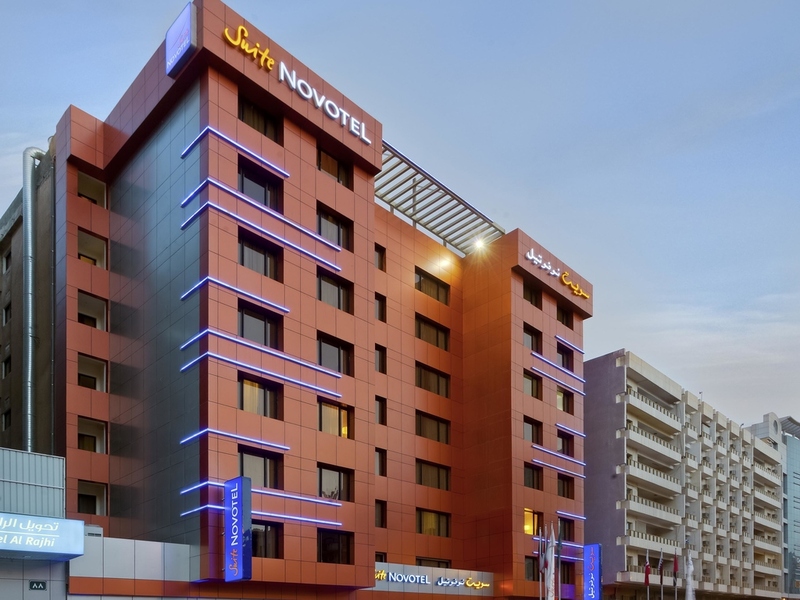 From Riyadh's premium shopping street, the Novotel Suites Riyadh Olaya hotel offers convenient access to the multinational corporate offices and government ministries of Saudi Arabia's capital. Two stunning skyscrapers define the skyline: Al Faisaliyah Centre, and Kingdom Centre, with its 99th floor Skybridge and heart-stopping views of the modern city and timeless desert beyond. For a comprehensive view of Arab history, art, and culture, visit the exceptional National Museum on King Saud Road. Ideally located in the heart of the city and 30km from KKIA airport, 30 minutes ride. Perfectly situated at the exclusive region's premier Olaya Street, providing guests direct link to an impressive selection of office towers & shopping malls. I enjoyed the stay. Quiet rooms. Nice helpful front desk employees. excellet front desk manager MR Fahad Aleissa. But very bad house keeping services. They don’t clean the room daily. Sometimes they clean the room late afternoon or in evening which is not convenient for me. If they found DND sign , they don’t come back to clean . When I call them for cleaning in late evening( even though room was not cleaned in morning) the cleaner ( Philippino guy) became angry and he claimed he was alone!!!! Not really a welcoming feeling. Hotel is ok. Rooms on front are kinda noisy due to heavily used road but at least it's not a mosque. Staff are indifferent. Food is so-so. Nice room, Fantastic check-in and check-out service. I had a very good experience of welcoming and reception service, the lady that welcomed me was so kind and she upgraded my room into suite, Thank you so much. On the other hand, the laundry service was unfortunate, as they ruined my clothe and didn't repay. Overall, the stay was good and quiet. Rooms are pretty good for the value. however the customer service is very basic and the breakfast as well. All wishes were fulfilled and situations handled well and resolved. No complaints. It was Ok but I did face some issues, starting from having 1 king size bed, although I booked a suite for 4 persons, and not ending with not fresh bread at the breakfast, absence of cold milk for cereal. Great hotel with good room facilities. Parking is a bit difficult though. I have written to you 2 times already that I am not the one staying in your hotel and thats not my name. I would want to know if there is someone living in your hotel under my id and you have not responded to my requests. What is even more surprising is the fact that I am already a Le Accor member and the same email id is registered for my account 30…1256. Can someone please respond. Suite are quite good, clean and tidy. The carpet are quite old. The receptionist have no ideas about the membership benefits, no welcome drinks or late checkout. The receptionist told me the latest are 2 o'clock and when I explained the other made it to 4 o'clock. They is no service which is provided by Hotel, breakfast is pathetic, Customer service is very bad, hotel room conditions are very bad, from AC dust is coming inside the room which make you unhealthy, food quality is very bad. Room, bathroom and bed are clean. Service could be improved. Location is good. Hotel Staff service and hospitality excellent. need improvement in transportation as there was no local transport facility no cars available. earlier there was a travel desk now it was removed. Breakfast need improvement as variety is quite less.